There are two basic types of satellite systems that are used for satellite communication. First in the discussion are low earth orbit satellites, or LEO satellites. These are satellites that orbit at an altitude between 400 and 1000 miles above the earth. LEO satellite systems consist of a number of satellites orbiting the earth to provide a net of coverage over all or most of the planet. From your location on the planet these satellites are constantly moving across the sky. They must hand off your signal from one satellite to another as they move across the sky and out of range, very much like cell phone towers hand off your cell phone signal as you drive down the freeway. Iridium, Globalstar, GPS and search and rescue satellites are examples of satellites in a LEO orbits. The second type of constellation is referred to as a geostationary system (GEO). Satellite in this type of system orbit at a very high altitude, about 22,000 miles above the earth. These satellites are positioned over the equator at various point around the globe. Their orbital speed matches the rotation of the earth, so the satellite always appears at the same point in the sky. Inmarsat, Vsat, Satellte TV, and other satellite broadband service are examples of satellite systems that utilize a geostationary satellites. First it must be stated that with all satellite systems, regardless of the satellite system type, your device’s antenna must be able to “see” the satellite for it to be able to send or receive a signal. This is an important point as we discuss the advantages and disadvantages of the different types of systems. Latency is the time it takes for the signal to travel through the satellite network. It is the time from when you say “hello” until the person at the other end hears “hello”. Because LEO satellites orbit close to the earth their latency is 2 to 3 times less than a geostationary satellite network. We are talking about delays of ¼ to ½ of a second for LEO satellites vs nearly 1 second for Geostationary systems. While neither are terribly detrimental, the difference is noticeable. Weather interference is another area where the LEO system typically out performs a GEO systems. The LEO system are generally not affected by weather, where GEO systems tend to experience rain fade and other weather related phenomena. Most people are familiar with the complaint of signal loss for Dish TV. Satellite coverage area is somewhat related to the constellation design. The Iridium LEO system consists of 66 satellites, orbiting from north to south to north, in a net that covers the globe. They function somewhat like cellphone towers in orbit, passing the signal from your phone from one satellite to another until it reaches an earth station and out to the public phone system. Its coverages is truly global. 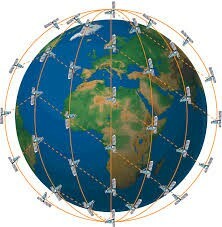 The Globalstar LEO system consists of 48 satellites in inclined orbits designed to provide coverage to most of the planet below the polar circles. The Globalstar constellation is configured in what they refer to as a bent pipe configuration. The mean the signal from your phone is received by the satellite and relayed directly to an earth station and out to the public switch. The satellite must be within range of not only your phone, but also an earth station. Because you can’t build earth station in the middle of an ocean, or in politically unfriendly countries, the active coverage area of Globalstar is limited. 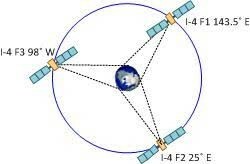 The Inmarsat constellation consists of 3 GEO satellites. They are positioned directly over the equator, equidistant from each other. The altitude, 22,000 miles above earth allow the satellite to see 360° around the planet, but because of the curvature of the earth the satellite cannot see beyond the Arctic and Antarctic circles. degree to perform optimally. This is true of Iridium, Globalstar, GPS and most other LEO systems. Standing next to a building, a tree, or in a deep valley, anything that limits how much of the sky you can see, could also limit the visibility of the satellites to your satellite phone and the reliability of the signal. LEO systems are designed to have multiple satellites in different parts of the sky to minimize this problem. Contrast this to a GEO satellite system where the satellite always appears in the same point in the sky. If your satellite phone can see the satellite then you will always have a signal, but if something is between you and the satellite you will never get a signal, unless you relocate your position. Because Geo satellites are located over the equator the further you get from the equator the more likely you are to have signal problems. This is partly because the signal must pass at an angle through more atmosphere to reach its destination. If you go far enough away from the equator, either north or south, eventually a Geo satellite will be below the horizon. It is important to note that many devices designed to work on geostationary systems have antennas that must be aimed at the satellite and cannot move. Satellite data capabilities are very limited on Leo satellite systems. Leo communication satellites are designed primarily to transmit voice calls. They’re limited bandwidth limits the speed and the amount of data that can be transmitted. Generally Leo satellite data can be used for restricted e-mail service, text messaging and text based Internet functions. The launch of the new Iridium NEXT satellites currently being deployed will increase the available bandwidth available via new Iridium devices considerably through 2018, 2019 and beyond. Geo satellite systems have much greater bandwidth and can be used for full service intranet and Data Services. To access high speed data on a Geo System the antenna associated with the hardware must be in a fixed position and aimed at the satellite or it must have the technology to track the satellite as the antenna moves. Data speed on GEO systems can range from 100 kilobits per second to 20 MBPS or higher depending on the system and the equipment.